The week-long tour, supported by the Samoan Football Soccer Federation Normalisation Committee (SFSF-NC), marks the start of Samoa’s national development programme building up to participation in the 2011 South Pacific Games in New Caledonia. The South Auckland-based Papakura side play three matches against national trial selections consisting of domestic based players only, chosen from the current Football Samoa Premier League competition. In the first match at the weekend, Samoa’s national selection showed strength and flair, particularly in a dominant second half, to soundly beat the New Zealand Northern League division one side 5-2. 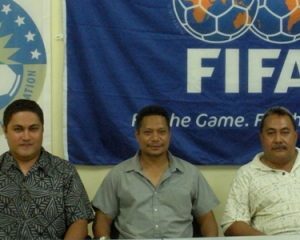 The win represents another positive step forward for SFSF-NC as the OFC Member Association continues to restore football activities in Samoa after a challenging normalisation period. SFSF-NC Chief Executive Colin Tuaa says that it is important to start the national squad development process now and establish a programme that will prepare the Samoa squad for success. Following the Papakura matches, SFSF-NC will begin a similar process for players based overseas with a series of trial matches in New Zealand. Papakura started strongly against the Samoa selection and dominated the opening exchanges against a hesitant local team. The visitors were rewarded when they took the lead in the 15th minute through Darren Woolnough after Samoa conceded possession from a poor pass by goalkeeper Sakaio Tokuma. Samoa then equalized in the 33rd minute after Fauivi Ugapo and Bert Keil combined well to set up Desmond Faaiuaso who scored with a well angled shot from 15 metres. Following a quick counterattack from Samoa, Papakura conceded a handball in their penalty area allowing Faaiuaso to score his second. Papakura goalkeeper Russell Dixon saved the penalty attempt, but Faaiuaso scored with the rebound. Samoa extended their lead early in the second half with Faauiaso completing his hat-trick after he connected nicely with a cross from Spencer Keil. Samoa steadily took control of the game and caused the New Zealand side problems going forward. However against the run of play Samoa goalkeeper Tokuma hit a poor pass directly to Papakura striker Rafael Monteiro who capitalised by running the ball into the goal unopposed. But Samoa responded quickly through striker Bert Keil who smashed in their fourth after another swift counter attack and a fifth came soon after via an unfortunate deflection off a Papakura defender. Samoa trial squad coach Tunoa Lui was delighted with the home team’s performance, particularly in the context of rebuilding Samoan football. “The future of this squad is very promising and with a proper development programme in place and the addition of overseas players this will be a strong Samoan squad come the South Pacific Games in 2011,” Lui said. Samoa starting line-up: Sakaio Tokuma, Fauivi Ugapo, Faletaau Tapeni, Andrew Setefano, Vaalii Lotu, Spencer Keil, Amilale Saloma, Fereti Gosche, Desmond Faaiuaso, Junior Michael, Bert Keil. Papakura starting line-up: Russell Dixon, Stuart Greenway, Darren Woolnough, Daniel Billot, Gustavo Fidelis, Evan Crean, Shane Godden, Rafael Monteiro, Humberto Alzes Junior, duardo Gianelli. Previous Post AUCKLAND – All Whites striker Shane Smeltz and 15-year-old Football Ferns forward Rosie White were the big winners at the New Zealand Football Awards luncheon in Auckland on Tuesday.